We will discuss the goals & structure of the club, and we will select our first official service event. This is a special invitation to attend a meeting on Saturday July 11th, at 9 a.m. at Pico de Gallo for the purpose of forming an Alamo City Chapter of Tejano Democrats. Endorse and support candidates for local, regional, state, national offices. So what difference can we make? Come to our first meeting on Sat. July 11, at 9a.m. Pico de Gallo, and help make that difference. See the attached. Minimum of 25 to form a chapter. We will of course continue to support all other advocacy groups of whom many of us are members. If you cannot attend, and are interested, please mail back the attached form and your dues by July 11th, 2015. Joe & Angie Farias invite friends, colleagues and family to join them for a 4th of July and end of session celebration! Saturday, A.C. Corral, 17490 Old Pleasanton Rd. 4 p.m. – 9 p.m.
Want to meet other young progressive San Antonians who are committed to making a difference? 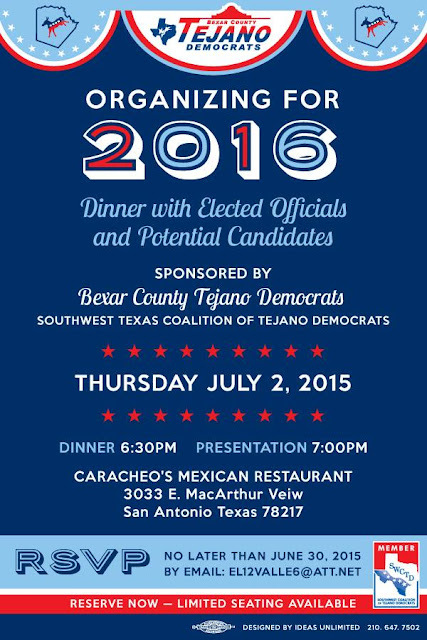 Join Bexar County Young Democrats this Thursday, July 2nd at 6:30 p.m. for our monthly meeting. We'll be talking about our summer community service projects and fall gala, as well as the Texas Young Democrats convention and upcoming Young Democrats of America national convention. The La Prensa family as well as the greater San Antonio media family and friends are in mourning for veteran San Antonio newsman Joe Sandoval who passed away June 18th from cancer. Only a year younger than me, my friend Joe was only 67. In his media career and mine, we worked at some of the same places over the years, but not at the same time. Only at La Prensa for nearly the past five years did we finally work together. For me it was well worth it. He was a great journalist and great mentor as well. Since both of us served in Viet Nam, we had much in common besides journalism. He graduated from John Kennedy High School in Edgewood ISD in 1967. I taught in Edgewood ISD 1980-81 at Memorial High School. Joe worked for a number of years as a reporter and assignments editor at La Prensa. He previously worked at News Radio 1200 WOAI in the late 1980s and at KTSA. He had also served as camera assignment's editor in the 1990s at KENS-5 TV where I worked as a reporter in 1982. We both did a stint at KONO Radio as well, again at different times. It was only recently that I learned that he was the winner of numerous radio and television awards from the AP, the Radio Television News Directors Association and other groups. He was a very modest man. Last year we both joined the Retired Radio Broadcasters group that meets monthly to share old war stories and reminisce about the good old days. We used to joke that the memories were better than reality. We both are members of the San Antonio Association of Hispanic Journalists, (SAAHJ) as well. He was one of the earliest presidents of the organization. Joe was also a cancer survivor, having survived colon cancer in the 2000s. Sadly it came back with a vengeance and took him from us. Many tributes to Joe worked their way onto Facebook this past week. Anais Biera Miracle posted: “I remember working with him throughout my PR career. Every time he would close our conversation, he would say, "Mija, we will see each other in the funny papers." We will all miss a great journalist and truly a wonderful friend to all that knew him. Rest in Peace mi compadre, Joe Sandoval. Are you planning or know someone who is planning on running for office in the upcoming 2016 Election Cycle? We hope you can join us and connect or reconnect with us as we start organizing for 2016.